The Newport Beach community and visitors to the pier area will be privy soon to the delights of Dory Deli, a new delicatessen featuring a slew of sandwiches, salads, side dishes, coffee, and much more. The venture by well-known restaurateurs Mario Marovic and Andrew Gabriel (recently known for the successes of Hopscotch and Wild Goose Tavern about which we've done interviews) has come to fruition after several months and opens its doors tomorrow, January 26th, bright and early. Cornered up with the likes of Il Farro and Seaside Bakery, Dory Deli has a street-side facing entrance as well as a way to get in from the back. Their menu has been crafted by Executive Chef Chris Rubinstein and Sous Chef Giovanny Bolivar, two talents who have made an impressive and unique list of dishes of which many are vegan-friendly! We got to visit for a sneak peek of the space and the food. It is bound to make people happy. 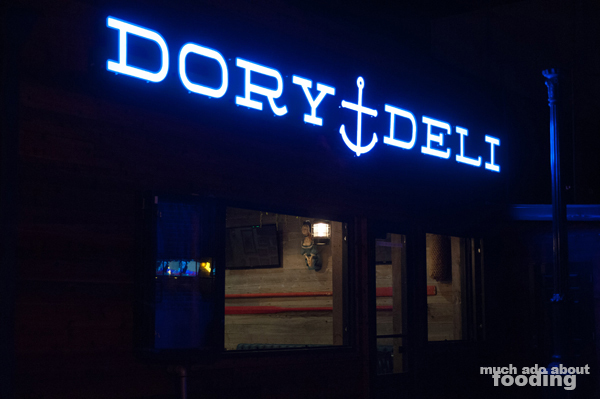 The entire space of Dory Deli is decked out in nautical-themed decor with plenty of history on the walls. Gauges every few feet may trick you into thinking they are clocks but don't be fooled; they're part of the environment! 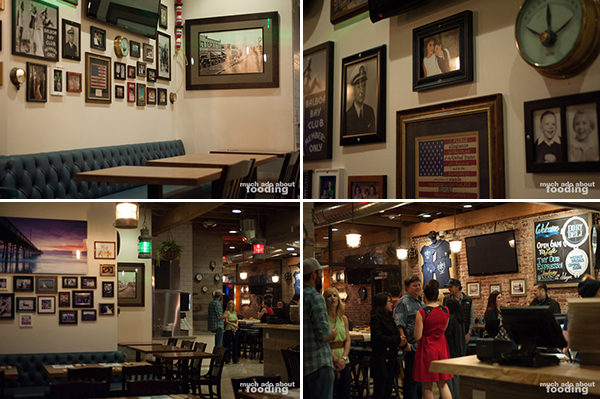 Framed old photographs contribute to the historic feel of the restaurant but hold more importance than that as they are also part of the owners' lives. 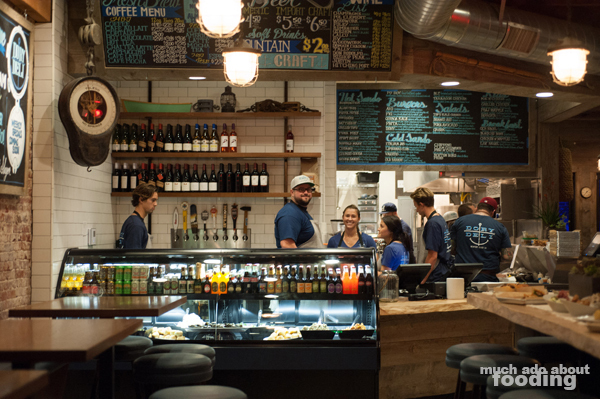 The typical deli case sits next to the counter with a variety of glass bottled sodas and craft beers. Enormous bowls of by-the-pound sides can be seen through here as well. If you are tempted by craft beers, don't worry - the eight tap handles will allow those drafts to flow freely up until midnight. So how's the food? Well, we sure got a look at that. To start, they will be selling rotating sides by the pound just as a true deli would. We were able to taste several of those. The Smoked Potato Salad (red potatoes, celery, onions, Vegenaise, whole grain mustard, and spices) is a vegan salad that really speaks to the person who loves smokiness. Simply made but brought up a notch by the smoky flavor, this potato salad was a good indicator of how Dory Deli takes classics and twists them ever so slightly. The Greek Salad ($8 - romaine, cucumbers, dehydrated Kalamata olives, Feta, crispy chickpeas, pickled red onions, and a roasted tomato balsamic vinaigrette) might not sound like it would be much but the dehydrated olives give dimension to the typical flavors by concentrating the tartness of an olive and flecking the salad with crunchy pieces. One of the table favorites was the\ Mediterranean Pasta Salad (sun-dried tomatoes, Kalamata olives, parsley, olive oil, garlic, and Feta) which seemed to marinate together well. Sweet, salty, and savory, it will surely become a favorite side. The Javanese Tofu Salad (peanut-braised tofu, red bell peppers, and broccoli stems) could take some getting used to for those who are not fans of cold tofu but the overall peanut sauce was a fine touch. Not picture was their Tarragon Chicken Salad (chicken breast, red grapes, walnuts, and Vegenaise), easily one of Duc's favorite because of the bursts of sweet grape to cut through any heaviness from the Vegenaise. Walnuts complemented the tarragon well with their nuttiness. 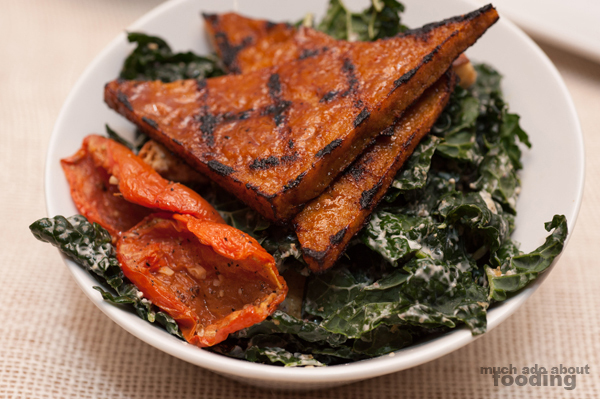 One I could see myself ordering often was the Grilled Tofu Kale Caesar ($8 - sweet and savory grilled tofu, Kalamata-caper dressing, sourdough croutons, and oven roasted tomatoes). a salad that replaced the typical romaine lettuce with kale for a Caesar. Creamy and dressed well into all of the notches and ridges of the kale leaves, the salad could easily fill one up. If not for salad, you could opt for a sandwich as Dory Deli has plenty. We had their Cubano ($11 - braised pork belly, mortadella, sofrito, pickled red onion, Swiss cheese and IPA mustard panini pressed on a sub roll), a prime choice for those looking for stacked meat in one bite. 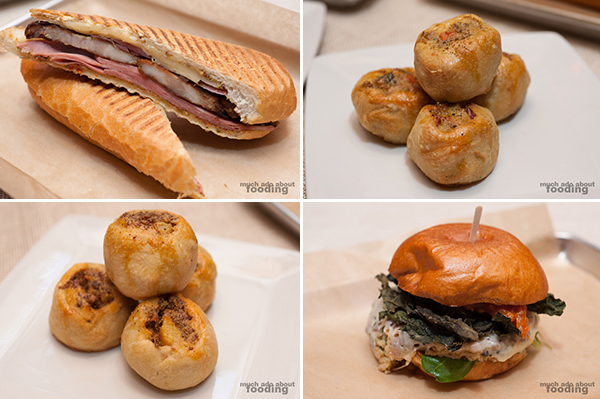 For snacking on, grab a few morsels of Knish (meat and vegetarian options), poppable mounds of dough and slightly-spiced filling. If you're feeling a little health-oriented, there is quite the savory vegetarian option in their Quinoa Kale Burger ($8 - quinoa and smoked mushroom burger, pickled kale chips, tomato jam, Swiss cheese, and a brioche bun). It is not often that I've seen a quinoa patty not come apart at the first movement but this one kept it together well enough to get through the bites. The melted cheese probably helped a bit! One important part of Executive Chef Chris Rubinstein's background is his roots in plant-based cuisine. Though plenty of the menu offers carnivore-loving items, there is also a strong impression and use of vegetables. 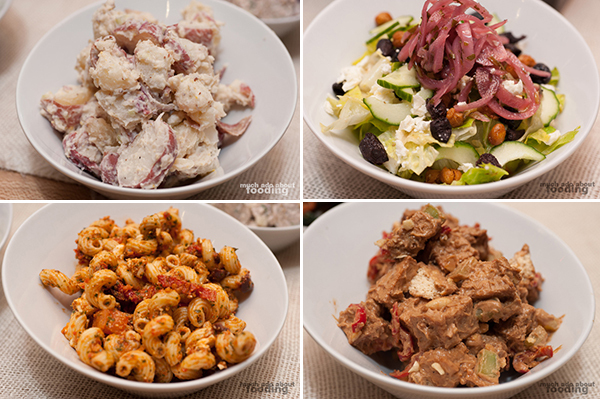 Some of the dishes are even purely vegan! 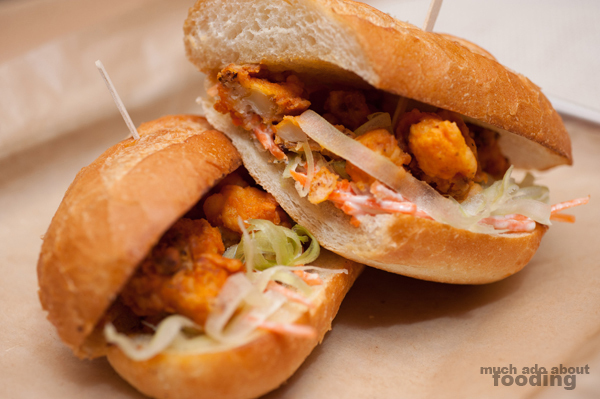 One of those which was an absolutely hit with everyone is their Buffalo Mary ($8 - crispy cauliflower tossed in buffalo sauce, shredded Ranch carrots, shaved celery and fresh greens on a sub roll) sandwich which mimics the texture of buffalo chicken. Florets of cauliflower are battered and fried before being doused in buffalo sauce to resemble wings. So tangy and fresh, the sandwich will predictably become a customer favorite. If not that, how about the Rocky Balboa ($8 - sliced steak, caramelized onions, peppers and house made cheese whiz on a sub roll) sandwich? 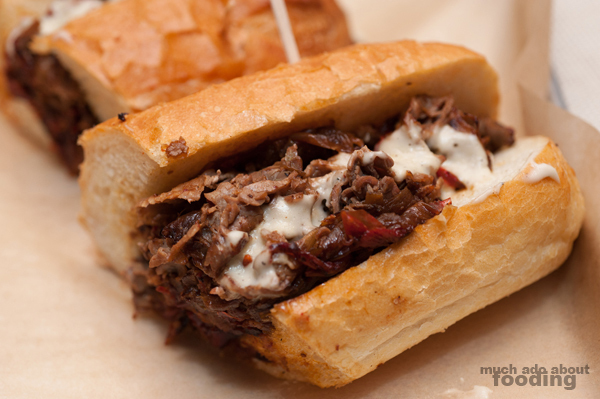 It is an interpretation of a Philly cheesesteak and a good contender when it comes to being delicious. The housemade cheese whiz contributes to authenticity of the iconic sandwich. 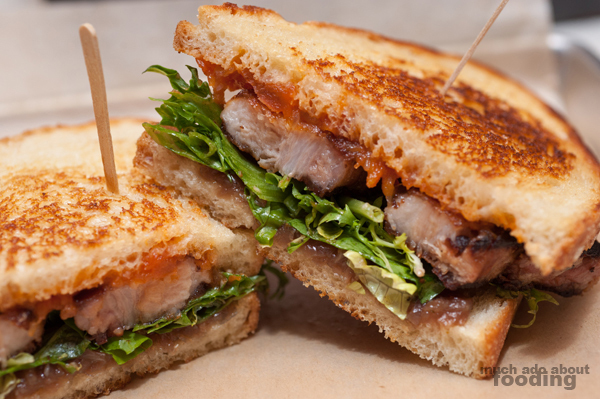 Now, if you are a pork belly lover, you can be sure there is also a sandwich for you - the Belly T ($8 - braised pork belly, onion marmalade, tomato jam and fresh greens on sourdough). It strikes me that Dory Deli has a strong idea of which deli classics can be shifted slightly into a more gourmet dish and then executes it well with Chef Rubinstein's 18+ years of expertise. The tomato jam may be a little overwhelming to some but overall, it was a solid sandwich. 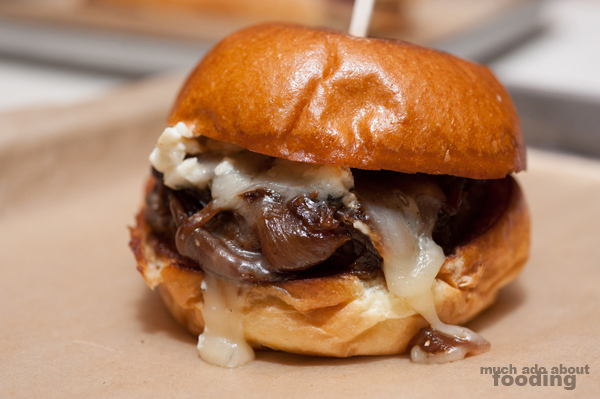 However, the best bite all night came from their Figgy Burger ($9 - fig preserves, goat cheese crème, caramelized onions, and a brioche bun) which did not look like much at first but packed a sweet and smooth punch. Part of its success comes from the thick, juicy beef patty itself which oozed out its juices upon first bite. It came off as a messy sandwich but one worth the trouble as the preserves paired with goat cheese created the perfect blanket for the beef patty. 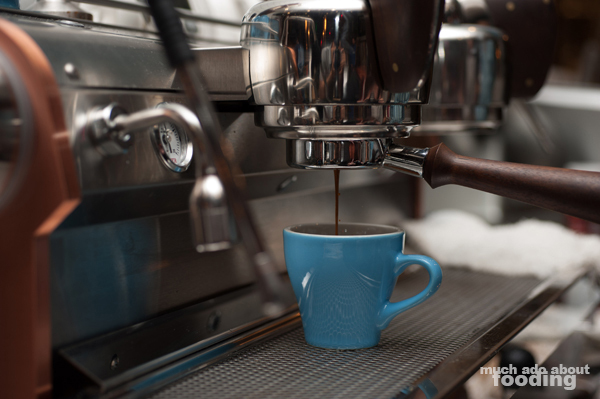 As if the food alone was not going to reel you in, Dory Deli also boasts the city's only Slayer espresso machine. 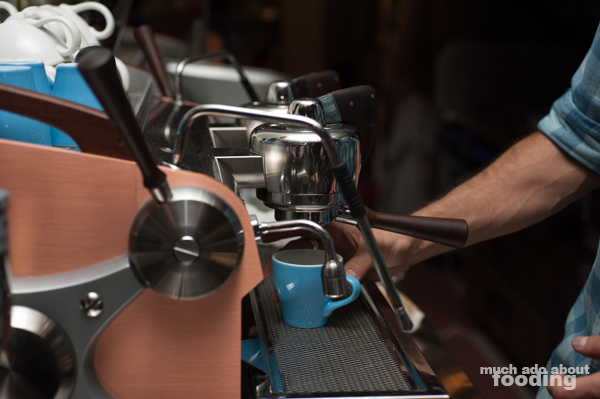 Hand-built and designed in Seattle, the tool is used for their espresso beverages made with Kean Coffee, a local Orange County favorite. They definitely know their coffee! The Slayer itself will pour forth what they claim to be some of the best coffee you'll be able to taste and certainly made from something unique to the restaurant. 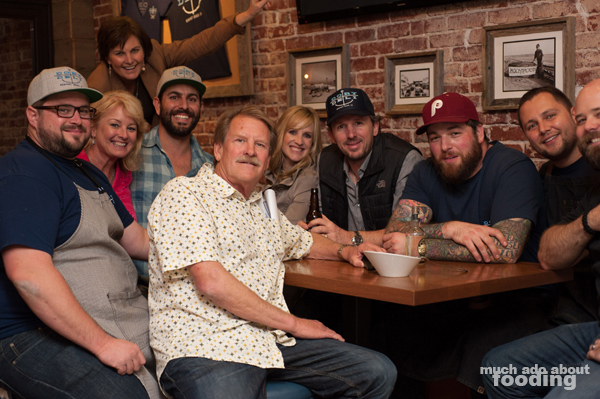 Our congratulations go out to the Dory Deli team, whom you can find at 2108 3/4 W. Oceanfront, Newport Beach, CA 92663 starting tomorrow, for the opening of their passion project!